Having completed some odds and ends of games graphics for a couple of Projector Games projects, I was asked to help out with the 2d graphics for their Xbox 360 live community game, 'Choc-a-riffic'. I was given some screenshots and a link to the trailer video on You Tube. The game is a fun, 'cutesie' platform game with many levels. My first task was to work on the level parts. As the game's physics had been created, I was sent the existing placement graphics to work to as templates. Firstly, I created some brick wall tiles with a few variations (some with missing bricks, some with ivy). The ivy was drawn in Expression design and pasted into the photoshop files to arrange on the wall. Then, thinking of the whole Easter chocolate theme, I had a go at creating a chocolate wall. Where the wall surface was to be ice, I thought of cake icing. At the back of my mind I remembered 'Zool' and how everything about that game was so edible. The walls were created in photoshop and I made full use of the embossed layer effects. The grassy slopes were created using the noise filter to convey an idyllic green grocer grass effect. 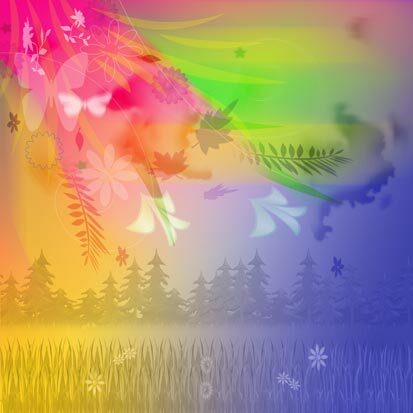 The flowers and leaves were drawn in Expression Design and pasted into the Photoshop files. The blocks of ice were given their glassy reflective look by making use of the blurring and opacity settings. 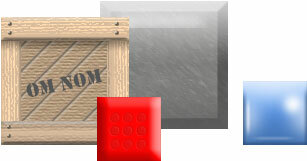 My next task was to revise a batch of objects such as rubber, metal, ice and wooden blocks and boxes. Continuing the sweet-tooth theme, I included some tasty nibbles such as a donut, a cupcake and swiss rolls. I made full use of the path tool and layers for these so that colours could be changed quite easily if required. A tile and a couple of animation states created a hamster-powered conveyor belt, again, created in Photoshop. 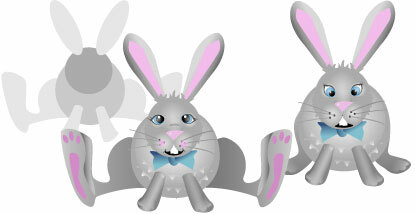 The Easter bunny's enemies run on wheels and had to be reversible so that they could move in both directions. I built the bodies and separated the heads out so that they could be applied to either end of the body. Other enemies were created in parts that could be manipulated independently by programming. The backgrounds were made up of distant mountains, green hills, mid ground trees and foreground grass. To try and create depth and the effects of light, I added noise, textures and gradients, all the time adjusting the opacity of each layer. I re-used graphics where possible partly to save time but also to help create a visual continuity across all graphics. Photoshop's brushes and custom shapes came in very useful too. A couple of moods of skies were also provided. 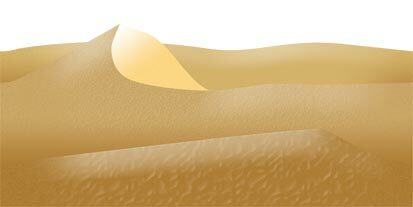 Additionally, I was asked to include a sand dune background which would tile seamlessly. Having sketched a few bunnies initially, my first stab wasn't quite cute enough so I needed to revise the face, particularly the eyes. I created several expressions that might be used throughout the game if required. The bunny was drawn with vector paths in Expression Design. I provided the bunny in 'body parts' so that they could be manipulated independently programmatically. 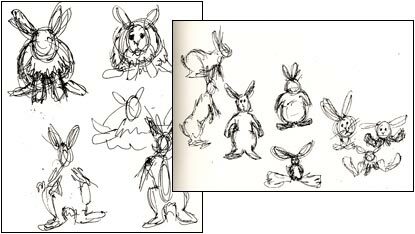 The final bunny was adapted to better suit the character's movement. Find out more about the game, how to download and give it a play!